In antiquity, the flow measurement was one of the first means of time measurement. But it was not until the steam engines development and the need to control their water supply, that measuring devices were developed. The gas and potable water distribution network development, brought the city of Paris to mandate individual water meters in January 1881. These meters were operated by a piston system, whereas in England and Belgium, pioneer countries in this field, turbine systems were chosen. The development of electric and gas instant water heaters in the 1920/1930 brought the necessity of a security system to avoid heating when there is no flow. The use of paddles operating a switch had a major issue: avoid the leaks of the passage through the wall between the water circulating and the electrical switch. Gasket and were not efficient and wre reducing the flow measurement sensitivity, especially for small dimension appliances. 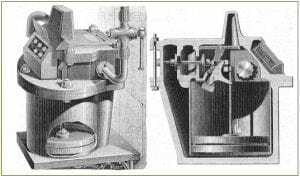 The first flow switch using a piston, without connection passage between water and electrical section , appears to be the Walker type, where the metallic piston displacement is measured by two electromagnetic coils located outside the pipe. between two magnetic coils (3 and 4) US Patent 1962795. 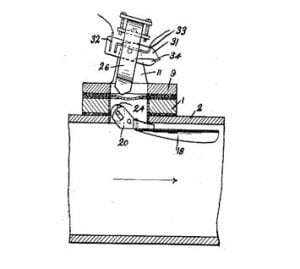 In 1931, the first paddle switch with a magnetic action is invented by Louis E. Richmond (US Patent 1888737). A paddle with a metallic roller actuates a balanced magnet with a mercury switch located outside. 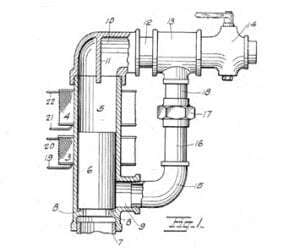 It was not until 1936 and the reed switch invention by the American engineer W. B. Ellwood of the Bell Telephone Laboratories (U.S. Patent 3,310,863) that freed paddle, piston or turbine flow sensors from gaskets and seals and allowed them to miniaturize. The reed switches are now used in thousands of different applications, and the annual world production is counted in hundreds of millions of pieces.